As predicted this was an easy victory for Roger in a very one sided affair against Frenchman Adrian Mannarino. The first set lasted a mere 25 minutes, with Mannarino losing his very first service game after a beautifully constructed point from Federer which resulted in a majestic forehand moving forward down the line (does anyone in the game play that shot better??). Followed by a great reaction volley to take the break. Mannarino finally got on the scoreboard at 4-1, but he still hadn't won a point on Federers serve – which was working exceptionally well, 120mph plus with a ton of variety. The problem with Mannarinos game is that he lacks any real weapon – which at the top level means he can't make any sort of impression. When playing a counter punch style of tennis, you can't expect to win alot of points pushing the ball into play and not really hitting through the ball. Nor can you get many cheap points behind a relatively ordinary serve, which instantly puts you at a disadvantage – to win points you have to cover a ton of ground and grind down you're opponent. For me I'd have liked to see him serve volley (he volleys pretty well) and try and go for broke on a few more points. When you're down 5-2 in the first set without taking a point on your opponents serve, you have nothing to lose, so taking chances is surely the most obvious course of action to take. The second set was more of the same, Mannarino was immediately down 15-40 after an 18 shot ralley that resulted in Federer making a sweet passing shot to setup the break point, which he duly converted. It wasn't until 2-0 and 40-0 that Mannarino won his first points on the Federer serve – which resulted in a rye smile and applause from the crowd. 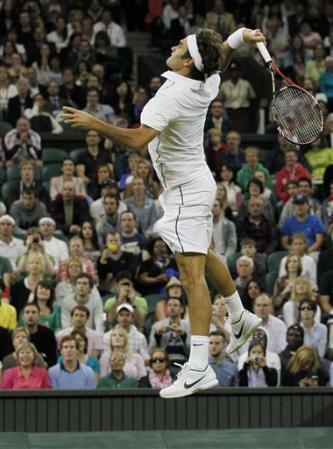 Federer swiftly moved to 5-3 in the second, where when serving for it he slipped to 0-40 after 3 errors on the bounce. Any doubts from Fed fans that he'd fail to serve out the set were swiftly answered – an ace made it 15-40, a great forehand and touch volley took it to 30-40, a lucky forehand that looped in made it deuce followed by 2 errors from Mannarino saw him seal it 6-3. The third by this point was a formality – Mannarino was broken first game after netting a simple volley and Roger went onto serve it out, slam dunking a smash on match point to seal it. I think I was able to set the tone early and stick to my gameplan, I served great at the beginning and kept that going for the remainder of the match. What conclusions can we draw from this match? In fairness – not a lot, but then again, we don't need to. It's clear that Roger is playing well, and in round 2 of the tournament that's all that matters – he's been on court for about 3 hours in total now, which is great news and means he is going to be very fresh heading into week 2 (I'm confident he'll make it comfortably). His serve is working well – which if it remains that way he can win this slam. I still don't think he's uber sharp on the return game, and he's shanking a few balls (always inevitable due to his racket head speed) but hopefully he can iron those out over the next match. And besides, if he's serving well, these kind of errors don't matter too much. Nalbandian was once Federers bogey man, he beat him quite often, for some reason Nadal used to have problems with him too but I don't think that's the case any more really for either player. I think Nalbandian is now too old (only 29 but his game is no way timeless), had too many injuries and not match sharp enough to cause too many problems for Roger here. For sure it'll be a tougher test than his first 2 matches. But if he keeps on serving this well Nalbandian won't stand much chance – I think a close opener, but straight sets 7-5 6-2 6-4.